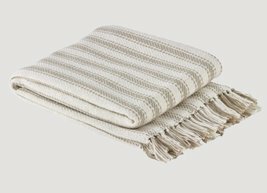 Add a beautiful touch to your home with the Farmhouse Ticking Throw. Stunning across your bed or on a couch or chair. Versatile and comfortable! Made of 100% cotton, measures 50" x 60". Machine wash cold, delicate cycle. Line dry.